Parents who are looking for great picture books for preschoolers may be interested in an If You Give a Mouse a Cookie book synopsis. This popular children's book written by Laura Numeroff and illustrated by Felicia Bond is worthy of a place in any child's library. If You Give a Mouse a Cookie tells the story of an energetic mouse that follows around a young boy. The mouse keeps making various requests, which the boy does his best to grant. By the end of the book, however, it's obvious that the poor boy is very tired from dealing with this bossy rodent all day! To an adult, the story in If You Give a Mouse a Cookie is very simple. To a child, this simplicity is part of the appeal. The story is easy for children to follow, and figuring out what is going to happen next gives kids a chance to work on their reasoning skills. Preschool teachers often use If You Give a Mouse a Cookie in their classrooms for lessons dealing with cause and effect. If you want to reinforce these concepts at home, DLTK Teach has several suggestions for activities you can do with your child. 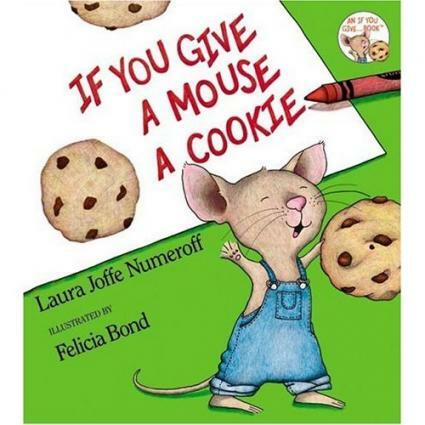 Although not all of the books in the If You Give series feature the mouse from the If You Give a Mouse a Cookie book synopsis, the basic cause-and-effect storytelling format remains the same for each title. Author Laura Numeroff grew up in Brooklyn, New York. Her father worked on the art staff of one of New York's major newspapers and her mother was a junior high school home economics teacher. She was the youngest of three girls and the entire family spent lots of time reading, singing, dancing, and playing the piano. As a child, Laura Numeroff wanted to be a writer until she saw her older sister begin a career as a fashion designer. However, fashion turned out to be a poor fit once she began college. She ended up taking classes in photography, animation, and broadcasting. A course in writing children's books during her last semester ended with her getting a contract for her first book. Illustrator Felicia Bond grew up in Bronxville, New York. She was the second oldest in a family with seven children. Like Laura Numeroff, she credits her childhood experiences with nurturing her creativity. Felicia Bond's mother spent many hours reading to her children and pointing out the art in their favorite books. Felicia Bond studied fine art while attending college in Texas, then moved back to New York to begin her career. She earned her first contract to illustrate a book at age 24. If You Give a Mouse a Cookie was her eighth book, published when she was 31.